All day long we’ve been wishing Mara a happy birthday and telling her she’s two years old. She has gotten pretty good at answering the question, “How old are you?” She says, “two” in her tiny voice with her all of her fingers up in the air and the pointer and middle stuck together like that indicates two. 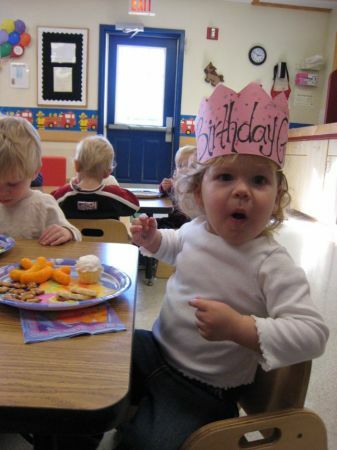 Today at her daycare you can see she had a celebration with her “buddies” in the class as we call them. She even got to help make her very own birthday hat for the party. You can tell by the plates of goodies that party really just means time to get a sugar high. Interestingly enough she is not at all into the sweets. She didn’t even eat a bite of her tiny cupcakes. Instead she opted for the hard sprinkle decorations they put on top of the frosting of the cupcake. Next week Mara moves up a class into Early Preschool 1. Her teachers pictured here with her, Mrs. Rogers and Ms. Fenner will certainly be missed. They have been so good to us! 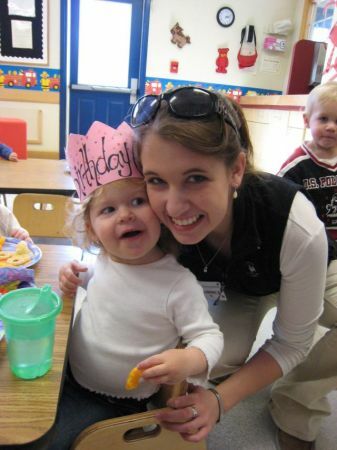 They are wonderful teachers who have not only taught her a lot but also loved on her. Which, to our little love bug who is always asking for a hug or a kiss means so much! 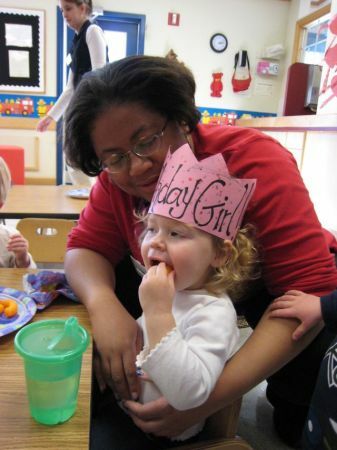 We are sad for her to leave the class where she is affectionately called “Mar Mar” by all. If you ask Mara whose baby are you when at daycare she’ll say “Fenner baby”. She has developed quite a bond with these two teachers so it’s a positive thing that her next class is just beside her old one so she can peek in and see them every once in a while. Tonight to celebrate Mara’s birthday we decided to take her out for her favorite food and the only one she has proactively asked for out of the blue which is….PIZZA!!! We chose Elizabeth’s Pizza. How ironic given the fact that, Mario, the owner dropped by our table and we told him it was Mara’s birthday to which he replied, “mine too”. He was so kind and sent over a chocolate dessert with a candle for her. She had no problems blowing out the candle! She now knows the words to the birthday song and sang them to herself while we were there too. All in all I think she has had a great 2nd birthday. We’ve celebrated it so much it might be hard for her to stop! Click on any of the pictures to see more!